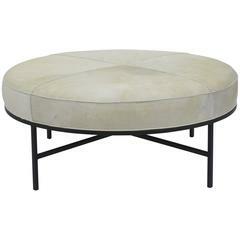 Rare original round Monterey coffee table or ottoman. Branded MONTEREY under the top. A removable custom leather cushion is included to use this coffee table as an ottoman. Measures: 17.5 in. tall / 20 in. tall with the cushion. H2 17.5. Excellent original condition. Amazing craftsmanship. 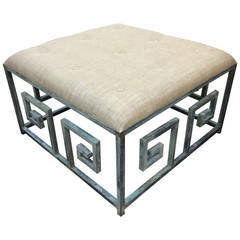 Medium 'Tambour' antiqued brass and hide ottoman by Design Frères. 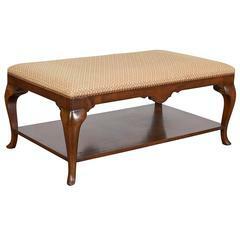 Upholstered firm, so also great as a coffee table, with a tray. 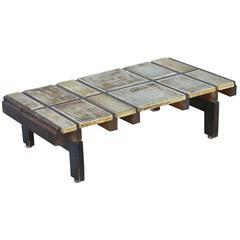 Rare Signed Ceramic Coffee Table by Roger Capron. A similar table was presented at PAD Paris in 2015. An exceptional piece. Greek Key Iron Ottoman Coffee Table-new unused.